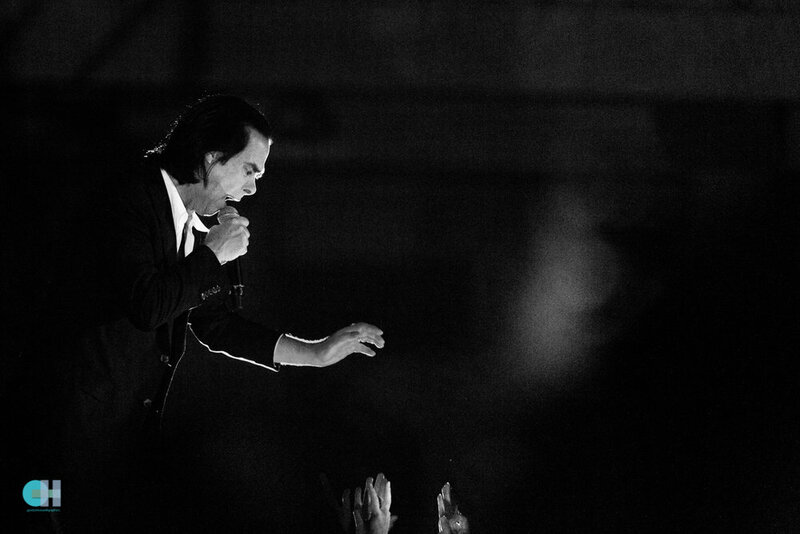 It is only fitting that, following a rainstorm of biblical proportions, Nick Cave should walk onto stage on the stroke of midnight and launch into ‘Jesus Alone’. Greeted like an ancient hero returning from war, the Athenian crowd erupts. He immediately asks the crowd if they got wet and mocks them by reminding them that he didn’t. ‘Who do you love?’ sounds triumphant and vital, the answer to which is clear. A bunch of flowers is given to him, later to be distributed back into the crowd, Drawings and t shirts are offered throughout the gig, as what? Sacrifices? Peace offerings to the rain gods? You’re too late. We may never know. The songs come charging towards us, ‘From her to Eternity’ is violent, the dancing demonic and the band behind him, led by the faithful Warren Ellis is on fire. Cave, looking the sharp dressed man as ever, dances up and down the runway and along the railings giving fans a rare up close encounter that not many are prepared to give. Hands are thrust into the air to touch their conquering soldier and he readily complies, holding hugging, kissing his disciples. Poses are struck, pianos are hammered and violins are swung overhead as a cascade of emotion pours down during ‘The Ship Song’, which of course, is majestic, the ‘girl in Amber’, ‘Jubilee Street’ and a heart wrenching ‘Push The Sky Away’. Between these we have the angry pulsations of Red Right Hand and Stagger Lee. The crowd roar, it is a hit laden set and he can do no wrong. Returning for an encore of Mercy Street and Rings of Saturn and then he is gone, 2am has hit and finally, the crowd can part, tired but oh so happy. Before all this however, The Editors are the main casualties of the weather, an hour long delay before they can start their set but the rain-sodden crowd refuse to let their spirits be dampened and greet them with enthusiasm and are rewarded with a high tempo, shiny set of songs taken from their new album, ‘Violence’ interspersed with classics from their back catalogue. Heavy on technology with booming kick drums and swirling synths they have an uplifting sound that is perfect for the Summer festival circuit and with a singer like Tom Smith who dances and gurns and flails his chicken arms through the set, you can’t help but smile as you nod your head. Nothing violent about this show. Preceding The Editors was Wolf Alice who have been playing the midday festival role for a couple of years now and are perfectly at home with it. Singer Ellie Roswell walks on the stage looking the perfect image of Summer in a long white dress as the band follows and launch into opener ‘Your loves Whore’. This is a band full of confidence having played similar spots all over the world and they reel off old favourites such as ‘Your a Germ’, ‘Bros’, and 'Fluffy', alongside new songs such as the deliciously angry ‘Yuk Foo’ and the softer ‘Save the Kisses’. Roswell’s voice carries beautifully in the open air as she croons and screams over the battered Jaguar led guitar lines and beds of noise from multi instrumentalist Joff Oddie. This is a band who aren’t afraid to experiment but never let it get in the way of the melodies. They rock, they seduce, they swing, they conquer. The crowd love them. Time to move up a slot or two on the festival ladder surely. Prormartyr on the other hand look as if they don’t want to be here. From Michigan, they tell us that they don’t like the sun, no kidding Sherlock, singer Joe Casey looks like he has been dragged from his great Aunts wake. Barely able to stand, dressed head to toe in a heavy suit and clutching a beer like his life depended on it, his face has turned beetroot red in the blistering Athens heat as he scowls into the sun. Looking increasingly uncomfortable he sways uncertainly in a way that would make Shane McGowan wince as he launches his vocal tirade into the early birds that have come to catch these garagesque post punk rockers. Fortunately for Casey the rest of the band, guitarist Greg Ahee, bass player Scott Davidson and drummer Alex Leonard don’t take any of the focus away from him, ignoring showmanship and instead preferring to pound out raw, tribalesque noise that pays homage to those that came before them from Motor City while successfully forging ahead with their own sound.